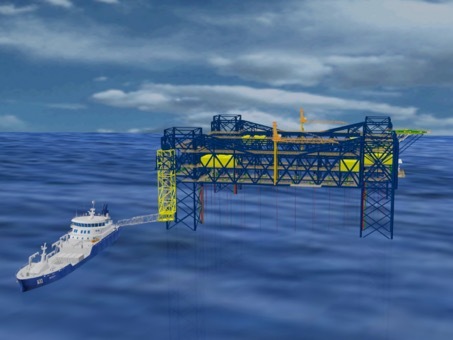 Erko Seafood and Global Maritime have collaborated on a new concept for offshore fish farming that involves a fish farm platform in the open sea. This began with a feasibility workshop and study in Autumn 2016, and was followed by a conceptual study in 2017. Based on the conceptual study, an application for a development concession was submitted to the Norwegian Fishery Directorate by Erko Seafood AS mid-May 2017. The fish farm is dimensioned according to the current rules and regulations so that it has sufficient capacity to withstand specific gravity, including equipment loads, as well as resist absorbent environmental loads from current, waves and wind. - OPSIM: Used for evaluation of various operations.